Recent Big Bend Community College graduate Francisca Juarez has officially been accepted into the Tesla START Student Automotive Technician Program at Shoreline Community College. Tesla START is a 12-week intensive training program that prepares students for a career with the electric vehicle manufacturer. During the program, students will develop technical expertise and earn certifications through a combination of in-class work, hands-on labs and self-paced learning. Students earn a wage while they are in the program, and upon completion, are guaranteed a job at one of Tesla’s many service centers across North America. Tesla START is only offered at four other community colleges in the country. Juarez will begin the program in January. “I’m kind of scared, but I want to work in automotive as a technician and improve my skills so I’m really excited for it too,” said Juarez. BBCC automotive instructor John Martin said he knew Juarez would make a great candidate for the program. When he first heard about Tesla START, he sent the information directly to her and encouraged her to apply. Juarez graduated from Big Bend in June with highest honors in the Automotive Technology program. She has been the only student to do so since Martin began teaching at the college. “The reason I specifically leaned toward Francisca as a candidate is that she is the hardest working student we have had since I started in fall of 2014,” said Martin. “Francisca was also one of the most teachable, respectful, and courteous students I have ever had, which makes her very employable.” Martin said he was also impressed with how Juarez dealt with some of the obstacles she faced while at Big Bend, especially in her first year. However, her dream of one day being independent, owning her own home and car and earning enough to support her family is what kept her motivated to finish high school and apply for college. She said she chose the automotive program because of the influence of her older brother, Joaquin, who passed away when she was 12. He was 21 and worked as a mechanic. “He taught me all about cars when I was young, and we used to work on them together,” said Juarez. Some of her friends, and some family members, initially questioned her decision and her ability to work in the automotive industry. Moreover, as the only female in her class, she received some negative feedback from her peers at first. Juarez added she was a little intimidated when she showed up for the first day of classes and realized she was the only female in the group. She hopes to serve as inspiration for other women who may be holding back from pursuing a career in automotive, or other fields, because of their gender. "It doesn't matter what you want to do, just be excited about it, and work for it, show up to your classes, do your work and always try to do your best," said Juarez. 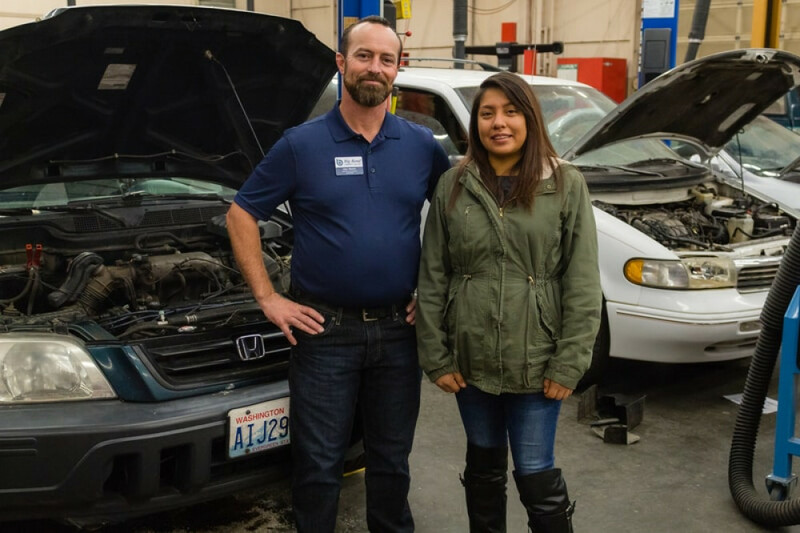 Photo: Francisca Juarez pictured with BBCC automotive instructor, John Martin.